All selections are in streaming Real Audio. To listen to the music, you will need the free Real Player. Click on the icon to download yours. To listen to a selection, simply click on the title. To listen to all selections played in the order they appear, click here. In 1929, talking pictures were still considered a radical innovation and were all the rage. While many artists at the time recorded this song, this version is my favorite. Very 1920s. I do not have much information about Johnny Hamp, but his band made many interesting records. This is from the flip side of the "If I Had A Talking Picture Of You" selection. I like the words to his one - sort of the "cheerfulness through all" type of song that would soon become more common with the onset of the Great Depression. This particular version enjoyed a revival in 1973 when it was featured in the closing scene of the movie Paper Moon. While I would not consider a "great" movie, I do recommend it. It chronicles the adventures of a third rate con artist (Ryan O'Neil) and an ingenious orphan (Tatum O'Neil) as they travel across Depression-era Kansas. 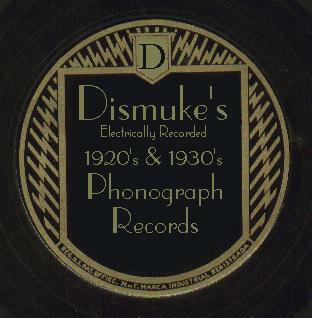 Lots of great old recordings are featured. Presumably the Waldorf refers to New York's famed Waldorf-Astoria Hotel. As I've said here before, I think Waller had a great band - and it gets featured more than usual on this selection. The commentary throughout the recording is vintage Waller. This was the band's theme song. In the '20s and '30s, racial segregation permeated all aspects of American society, including the music and recording industries. While the more famous black bands frequently performed for white-only audiences, the reverse was not the case. For jazz fans, the black bands of the era are often considered superior to the white and, as a result, their records are much more sought after and difficult to find. By the mid-'30s, the color barrier began to slowly fall when Benny Goodman hired black musicians such as Teddy Wilson and Fletcher Henderson - whose arrangements were largely responsible for Goodman's meteoric rise to being the "King of Swing." Ipana was the name of a popular brand of toothpaste. The Troubadours were, in fact, the Sam Lanin Orchestra. The use of recording pseudonyms was extremely common at the time - Lanin's band recorded under dozens of names. This was made before Crosby achieved stardom. He is not even given credit on the label, which merely states that the record features a "vocal refrain." There's a bit of distortion on the opening seconds of the recording but since this is a pretty scarce record it my be a while before I run across a cleaner copy. I love swing, and there are those who have said that I should feature more of it. I don't because most of the great swing bands have been reissued on CD. Not so with the dance bands of the '20s and early '30s. I will, however, feature at least one swing selection each month. I first heard this song in a movie - I forget its name - that I rented. I immediately recognized the band as Goodman's and fast forwarded to the credits to get the song's name. That weekend I went out specifically to find that record - which I fortunately did. Reisman recorded this less than one month after the stock market crash that precipitated the Great Depression. The name and lyrics were truly ironic as this song, more than any other, came to symbolize the Depression and the New Deal. Despite such negative associations, however, I actually like it. Ballew sang on numerous records - mostly on the less expensive dime store labels - during the late '20s and early '30s. He was known for his ability to sing in virtually any key. For a while he fronted his own band. Later he went to Hollywood to star in a few "singing cowboy" movies. After World War II, Ballew left the music business and moved to Fort Worth, Texas where he became an engineer. Ballew frequently used a pseudonym when he recorded. On this recording he is listed as "Buddy Blue." Time for a little change in tempo. Ray Noble and Al Bowlly had the best known version but I am rather partial to this one. This song is addictive. Play it a couple of times and soon you will discover that people are staring at you funny because you are whistling it as you walk down the aisles of the supermarket! In the '20s and '30s, cities were vibrant, exciting places to be. Downtown was the place everyone headed for entertainment and shopping. There were movie theaters, and vaudeville houses. The big hotels all featured live dance bands. Prohibition era night clubs selling illegal booze often featured hot jazz bands and live entertainment. People felt safe walking the streets at all hours. At night the buildings glowed with huge elaborate neon signs and lights. Today, most cities have sign ordinances that prohibit such displays. In many places, inner city crime and television keep people home. While Murray and Scanlan's jokes are pretty lame, this is still an interesting and entertaining record. Note the reference to the 1928 election. This is from the flip side of the Lindbergh record I featured last month. A pioneer in early radio broadcasting, De Leath eventually was billed as "Radio's First Song Sensation." In 1939, she made pioneering appearances in another new medium: television. This record - Victor 25461 - is rare. Shortly after it was issued, Victor recalled all copies because of a dispute about the use of Fitzgerald, who recorded for rival Decca - even though her name does not appear on the label. This copy was one of the few that managed to be sold before the recall was ordered. Victor 25461 was then reissued with Frances Hunt doing the vocal. I consider myself extremely lucky to have found this record, for which I paid less than a dollar!